Stubby Pencil Studio serves up Valentine’s Day fun with these cartoonish 100% recycled stock Valentine cards. Cards come in a pack of twelve along with colored envelopes, and there’s space for a personal message in each. 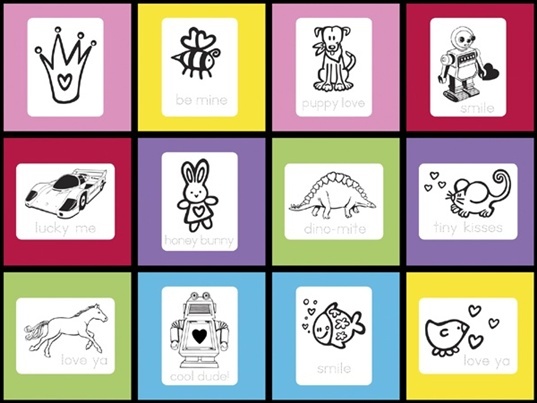 The simple designs are especially suitable for younger children to color and decorate. For a total eco-art experience, pair these with Soy Crayon Rocks or the very cool Twig Crayons. Stubby Pencil Studio serves up Valentine's Day fun with these cartoonish 100%�recycled stock Valentine cards. Cards come in a pack of twelve along with colored envelopes, and there's space for a personal message in each. The simple designs are especially suitable for younger children to color and decorate. For a total eco-art experience, pair these with Soy Crayon Rocks or the very cool Twig Crayons.